In Christian Latinity, the tractate is a specific type of sermon, delivered as part of a liturgy, which combines scriptural exegesis, preaching, spiritual commentary, and theological reflection. 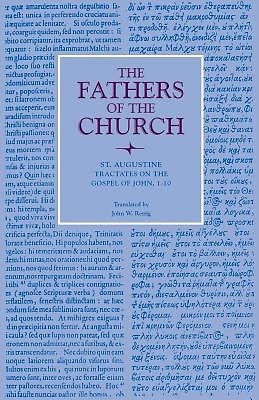 This volume contains the first ten of the 124 tractates on the Gospel of John delivered by St. Augustine, the world-renowned fourth-century bishop of Hippo Regius in North Africa. As sermons they exemplify the theory of preaching he outlined in his De doctrina Christiana (On Christian Instruction) --to preach in a simple and direct style accessible to all without compromising the theological knowledge and spiritual experience of the message. Because John's Gospel particularly emphasized the divinity of Jesus, the identity of the historical Jesus with the Messianic Christ, the Trinitarian Word, these sermons necessarily involve much Trinitarian and Christological theology. They explain and defend the orthodox position established at the councils of Nicea (A.D. 325) and Constantinople (A.D. 381). Their major theme is that Jesus Christ is the center of the Christian life, the Son of God and the Son of Man. Beyond contemplation of John's Gospel, the Tractates reveal much about the heresies to which Augustine's congregation was exposed: Manichaeism, with its dualistic logic; Donatism, a schismatic, puritanical, and sacramental movement which involved the intervention of the state in the affairs of the Church; and Pelagianism, with its doctrines of original sin, grace, free will, and predestination. Augustine delivered these sermons in Ciceronian oratorical style, having as his purpose to teach, to please, and to persuade. Through his allegorical exegesis, his audience was led to an understanding of the meaning of Scripture that would so affect their souls as to help them grow spiritually and bring them to eternal salvation.